Whether you’ve just moved in or you’ve been in your apartment for a while and want to revamp it, Oakleaf wants to make sure it always feels like home. We all love a big open floor plan, but it can be challenging to divide up the space, particularly when one room must perform more than one role, like a dining room and a living room. If this is your situation, you thankfully have several options. You can look for dual-purpose furniture, like dining room chairs that can be turned to make additional seating in the living room. You can also look for dividing pieces, like an open bookshelf, a low credenza, or a large plant, to help break up the room. If you aren’t allowed to paint—or just don’t want to—grab that off-white bull by the horns and make it work for you. Use it as an opportunity to throw some real color into your accessories, and bring the white into other pieces you have, like accent chairs, drawer pulls, and pillows. This will make the white walls seem intentional and anything but standard apartment fare. Vinyl wall graphics are an apartment renter’s best friend, especially for those of us in Iowa, Nebraska, and South Dakota who have a particular love for pretty quotes and big, iconic images. These graphics attach right to the wall and peel away cleanly, allowing you to really cling to a design style without fear of losing your security deposit. The most effective way an apartment can feel like it’s got high design in low square footage is when it’s not cluttered with stuff. Maximize your storage and your style at the same time by putting bins under your bed, building or buying some floor-to-ceiling wall shelves, and look into ottomans and coffee tables that have additional storage. If you can’t paint or hang wallpaper to dress up your walls, go fab with fabric. Adding several curtain panels to a plain wall adds personality, gives the illusion of bigger windows, and also adds luxury and depth to an otherwise flat space. 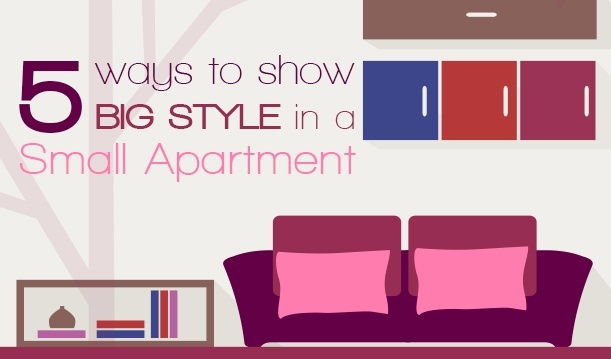 It doesn’t matter if your apartment is in northwest Iowa or in the middle of Nebraska, you can bring big style to its every corner with these tips. Which one will you try first? Your new Oakleaf PM home is just a click away. Push the button below to submit an application.